Mr. McCain respected both Bush and Obama and vice versa, despite their disputes over important issues – as opposed to the Senator's feelings towards current President Donald J. Trump, who was explicitly not invited. Many in the Cathedral and beyond will watch as Mr. Bush and Mr. Obama seize the moment, not only to honor their mutual defeated adversary, but also to send their own message to the man who now turns the white building on Pennsylvania Avenue occupied once lived. Will there be a counter-programming? Mr. Trump has made his contempt for Mr. McCain clear even in the week since his death, but many eyes will scan the President's Twitter feed on Saturday to see if he succumbs to the impulse to his own thoughts on the day of the commemoration of the Senators or otherwise create messages to distract from the event. Trump had to be verbally abused by his staff for two days just to figure out a pro-forma statement that respected Mr. McCain's service and the flags until sunset on Sunday, the day the United Nations senator buried should be appointed, semi-crew States Naval Academy. He refused to cancel a campaign-like rally in Indiana scheduled for the same day as serving Mr. McCain in Arizona on Thursday. He initially planned to spend the weekend at Camp David, but decided to stay in the White House instead. Much attention will be focused on who was invited and who was not. Among the unlisted reports is Sarah Palin, his candidate in 2008. In a documentary and a new book earlier this year, Mr. McCain said it was a mistake not to consider Mr. Lieberman as his candidate for the vice president and while he said he did not do Ms. Palin, she took the comment as "a belly punch." Politico reported that three former campaigners did not cut across to Mr. McCain – Steve Schmidt, Nicolle Wallace and John Weber. Mr. McCain and Mr. Weaver had a sometimes turbulent relationship, and Mr. Schmidt and Ms. Wallace later became public critics of Ms. Palin and their selections, though all three remained admirers of the Senator. Mr. McCain loved traveling around the world to meet with everyone, from foreign leaders to rebel leaders, and he made it his mission to travel with members of both parties. His list of pallbearers is in some ways similar to one of these congressional delegations, called Codels for short. From the Democratic side of the aisle will be former Vice President Joseph R. Biden Jr., Senator Sheldon Whitehouse, and former Senators Russ Feingold and Gary Hart, all served by Mr. McCain. From the Republican side will be former Sen. Phil Gramm and former Governor Tom Ridge and William Cohen, who served as a Republican Senator, before entering the Cabinet of President Bill Clinton as Secretary of Defense. Former Mayor Michael R. Bloomberg of New York, who was a Republican, Democrat and Independent, will also attend. 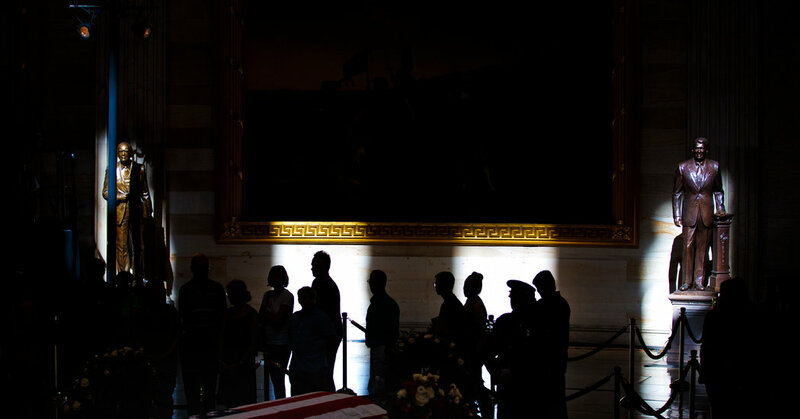 Among the other casket bearers will be Warren Beatty, who never served as a senator, but on the big screen was "Bullworth," the story of a politician who is finally breaking the shackles of trading to tell it the way it is – something that Mr. McCain praised himself for.